While a majority of people relying on the washing machine to keep their clothes clean, only a few give priority to washer cleaning. 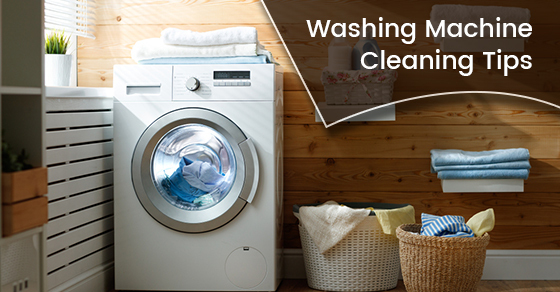 Just as clothes need constant washing, your machine also needs regular cleaning. Some people may assume that the detergent they are using to clean the clothes also cleans the machine. On the contrary, some detergent remnants may dirty the machine. Laundry dirt, hard water, and detergents can cause a build up in the inner parts of the washer. If not properly cleaned, your washing machine will begin to develop an odour. Poor maintenance can also cause leaks, substandard cleaning results, and breakage. So, how do you ensure your washing machine remains clean and functional? Here are the top home cleaning tips you can implement on a monthly basis. First, let’s look at what you need for the job. Before you clean a front load washing machine, remove the detergent drawer. Detergent drawers can retain excess detergent, which can cause the drains to clog over time. It is also a haven for germs and can become a health hazard. A dirty detergent drawer can have a negative impact on how your clothes are cleaned. For the best outcome, remove the detergent drawer and place it in warm water to soak. Then, use a toothbrush to remove any residue. Don’t forget to get rid of the dirt in the cavity too. Once it is cleaned, use antibacterial spray to kill any germs. Your washer comes with a user manual, therefore, you should have instructions that explain how to do this. If you are still unsure, consult your cleaning service provider. Before cleaning the drum, clean the rubber bands that run across the drum. The rubber gasket tends to collect fluff from clothes, and if you let it build up, it will become difficult to remove. For better results, use a damp cloth to wipe the seal before and after each wash to ensure your machine doesn’t pick up fresh dirt every time you use it. During your normal monthly cleaning routine, scrub out anything that sticks to it, and spray the bands with antibacterial disinfectant. Even if the inner part of the machine appears clean, you should still clean it because there are several nooks and crannies that can host germs. The simplest way to guarantee it is clean and germ-free is to run an empty wash after a few months. Mix your baking soda with hot water and set the machine to run on a hot water cycle. This will disinfect the washer and remove any nasty smells. You can also use vinegar instead of baking soda. After the empty wash, leave the machine’s door open to dry the drum. If you have pets in your house, there is a high chance that your machine has pet hair in it. The simplest way to remove pet hair is to leave the drum to dry completely, and then use a soft brush to vacuum out the hair. The filter prevents debris, tissues, hair, and minerals in water from polluting your cycle. When left unchecked, it can clog, which may prevent the free flow of water into your washer for a fresh cycle. In most machines, you will find the filter at the front part of the washing machine hidden behind a hinged cover. To clean filters, turn off the water supply and remove the hatch (hinged cover). From here, get rid of everything that accumulated on the filter. Additionally, check inside the cavity to make sure you have eliminated any trapped debris. Then wipe the filter with a cloth or kitchen towel. In some instances, the filter may have a waterlog behind it as a result of the heavy blockage, so you need to have a bowl or pan ready to collect excess water. When you are done with cleaning the interior, don’t forget to wipe the surface of the washing machine with a damp cloth. While doing so, avoid solvent or abrasive cleaners, which can damage or scratch the surface of the appliance. One of the simplest, yet effective, home cleaning tips is to clean your washing machine on a monthly basis. A majority of newer washer models come with a custom machine cleaning cycle. If your machine doesn’t have the customized cleaning plan, pour chlorine bleach into the dispenser and run an empty wash with hot water. You can also use specialty cleaners. It is not a must to thoroughly clean the washing machine after every wash. But there are several small measures you can take to ensure the washer runs smoothly in between uses. Immediately after every wash, remove all clothes. Emptying the washing machine after the end of a cycle will prevent odours from developing in the washtub. The odour can be easily transferred to your clothes. On top of this, you should also leave the door slightly open to allow the free flow of air, which will dry out any remaining moisture. It doesn’t make financial sense to spend so much on your washing machine and then neglect it. Use the above home cleaning tips to ensure your machine decontaminates your wardrobe for several years. Cleaning your washing machine regularly will not only keep it running, but you will also eliminate repair expenses. If you are unable to maintain a regular cleaning regimen, it is a good idea to hire a cleaning service. Remember to read your washing machine user manual before applying the above home cleaning tips. Also, use the right detergent. Powder detergents are usually ideal. Some hand wash detergent such as liquid softeners or extra suds may leave residue on your automatic washing machine, which can significantly affect its longevity. Are you in need of a cleaning service? Sunrise-Cleaning is a leading cleaning service provider in Ontario. For more information, call Sunrise-cleaning at 289-814-1824 or contact us here.